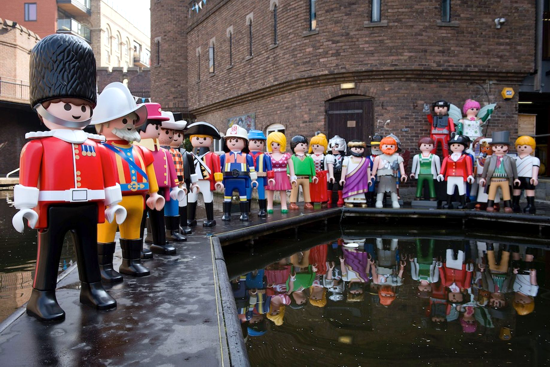 Features: Playmobil is a line of toys produced and marketed since 1974 by Geobra Brandstätter in Zirndorf, Germany. 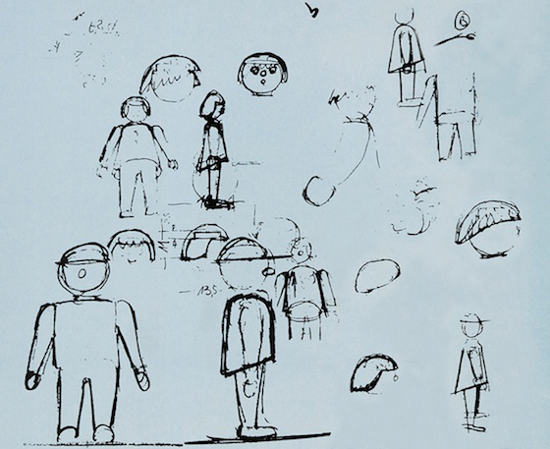 The plastic figures, at 7.5 cm tall, fit in a child's hand and its facial design was based on children's drawings - a large head, a big smile, and no nose. 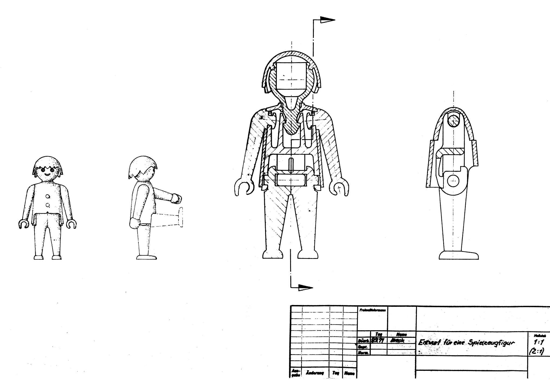 Parts make up each figure: hair, head, torso, inner mechanism, two arms, and a set of legs. 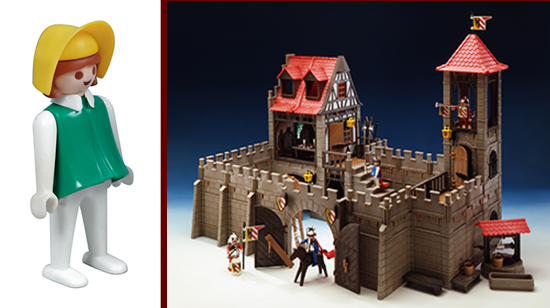 The first product series, introduced in 1974, were: Knights, Construction workers and Native Americans. Each of these three themes had it's own color. 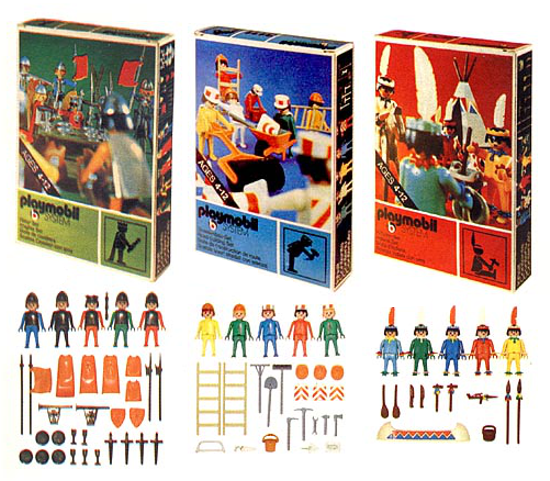 Boxes containing knights and medieval accessories were green, construction sets were blue, and boxes with Indians and wigwams were red. 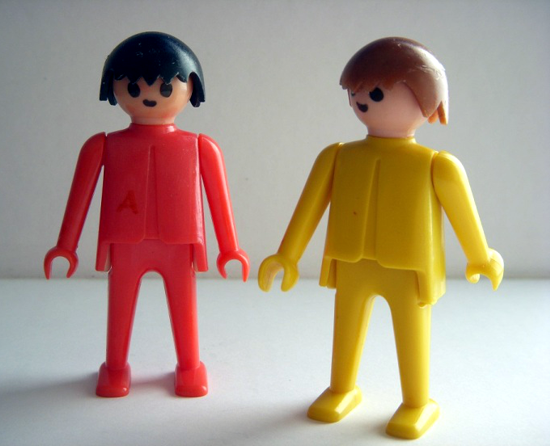 In the seventies, a Playmobil figure was also known as a "Klicky", referring to its typical klicking sound. 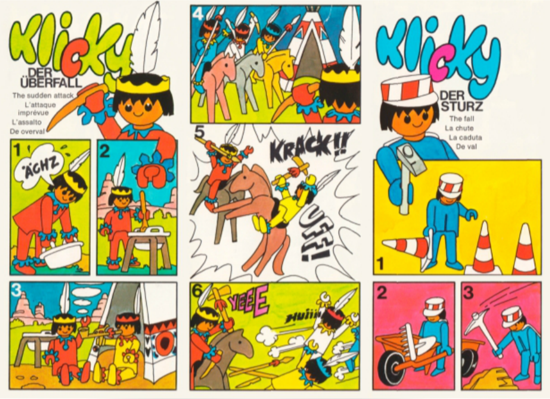 A "Klicky-Tag" was printed over the cover picture. The tag also shows the number of figures contained in a particular box. Female figures were introduced in 1976. Interesting facts: In the Sixties, Geobra had been producing hoola-hoops and large plastic toys, but in the early 70s the rising oil prices imposed on Geobra Brandstätter demanded that the company turn to products that required less solid plastic material. So, the company's owner Horst Brandstätter asked the German skilled craftsman Hans Beck to develop little toy figures for children achievable with less plastic. 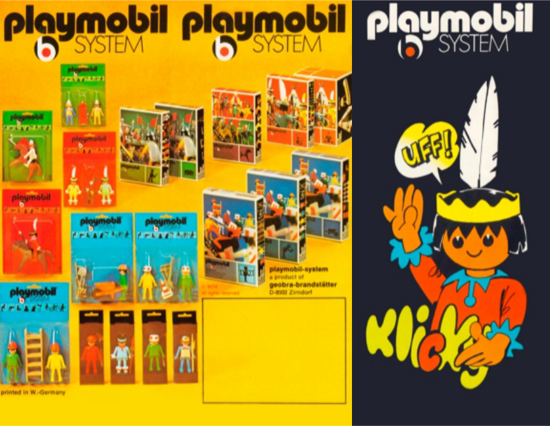 Hans Beck spent three years from 1971 to 1974 developing what became Playmobil. 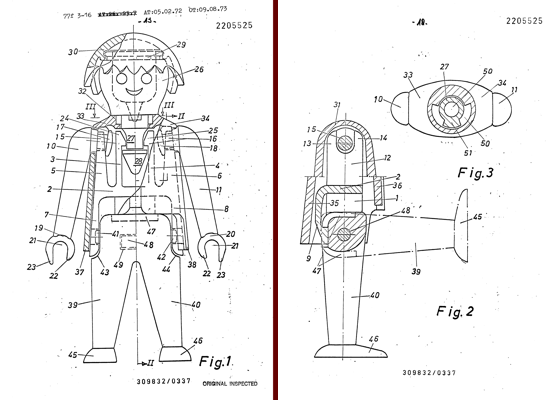 He conducted research that allowed him to develop a toy that would not be too complex but would nevertheless be flexible. He felt that too much flexibility would get in the way of children's imaginations, and too much rigidity would cause frustration. 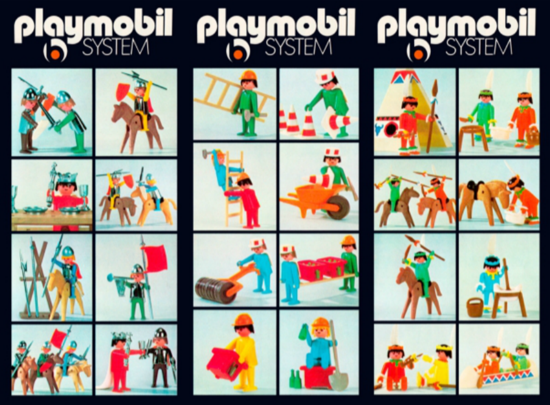 Playmobil makes its first official appearance in 1974 at the company trade fair at geobra Brandstätter in Zirndorf. In February, at the International Toy Fair in Nuremberg, a Dutch firm agreed to buy a whole year's production. 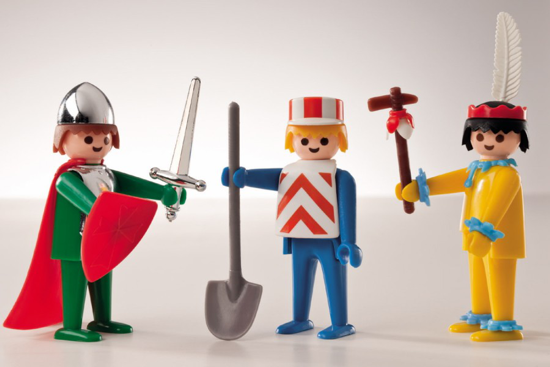 Playmobil began to be sold worldwide in 1975, and has remained a popular toy ever since. 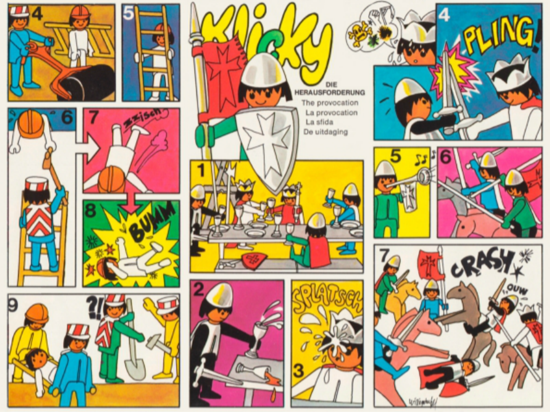 By court decision, the Playmobil figure is an original piece of art and, therefore, is copyright protected for up 70 years following the death of the creator. 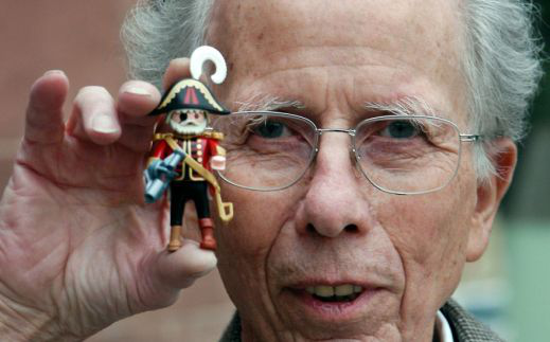 Hans Beck (Greiz, May 6, 1929 - Markdorf, Jan. 30, 2009), the creator of Playmobil. 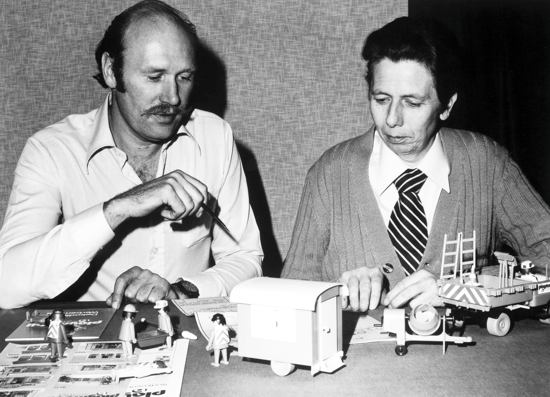 Top: in 1975 with Horst Brandstätter (left), Playmobil's owner and the great-grandson of the company's founder.